This article is about indigenous people of Tahiti. For other uses, see Tahitian. The Tahitians, or Maohis, are a nation and Polynesian ethnic group native to Tahiti and thirteen other Society Islands in French Polynesia, as well as the modern population of these lands of multiracial, primarily Polynesian-French, ancestry (French: demis). The Tahitians are one of the largest indigenous Polynesian ethnic groups, behind the Māori, Samoans and Hawaiians. The first Polynesian settlers arrived in Tahiti around 400AD by way of Samoan navigators and settlers via the Cook Islands. Over the period of half a century there was much inter-island relations with trade, marriages and Polynesian expansion with the Islands of Hawaii and through to Rapanui. The original Tahitian society was unaware of metal as it was based on Stone Age technology. However, it enabled Tahitians to clear land for cultivation on the fertile volcanic soils and build fishing canoes, their two basic subsistence activities. The tools of the Tahitians when first discovered were made of stone, bone, shell or wood. The Tahitians were divided into three major classes (or castes): ari'i, ra'atira and manahune. Ari'i were relatively few in number while manahune constituted the bulk of population and included some members who played essential roles in the society. It is estimated that by the first contact with Europeans in 1767 the population of Tahiti was no more than 40,000 while other Society Islands held probably 15,000-20,000 natives. Three hundred Tahitian volunteers fought in the European theatre of World War II with the Free French Forces. In the late 1960s and early 1970s Tahitian poets Henri Hiro, Charles Manutahi, Vaitiare and Turo Raapoto spearheaded the anticolonial writing in Tahiti. Hiro's God of Culture implores Oihanu, the Tahitian god of culture and husbandry, to empower the 'new generation'. Three women writers - Michou Chaze, Chantal Spitz and Vaitiare explore the problems of Tahitian identification in contemporary French Polynesia. 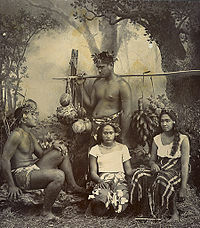 Tahitian peasants and workers call themselves the 'true Tahitians' (Ta'ata Tahiti Mau) to distinguish from part-Europeans (Ta'ata 'afa Popa'a). At the same time demis quite frequently identify themselves as indigenous people in terms of culture and political affiliation. Such Tahitian activists as Pouvanaa a Oopa, Francis Sanford and Charlie Ching and Catholic bishops Michel-Gaspard Coppenrath and Hubert Coppenrath are of demi ancestry. Many natives were painted from life by Paul Gauguin, who gave Tahitian titles to his works. In Ea haere ia oe (Where Are You Going? ), for example, a pensive young girl wears the white flower tiare behind her left ear, signifying readiness to take a lover. Tahitians are French citizens and are represented by two elected deputies to the French National Assembly and one representative in the French Senate. Tahitians vote by universal adult suffrage in all major French elections. ^ Tahitian has no " l " while Hawaiian has no " r ," otherwise, the Tahitian ari‘i and Hawaiian ali‘i have similar connotation. ^ "The Ancients". Hāʻena. Pacific Worlds & Associates. 2001. Archived from the original on 2010-01-15. Retrieved 2009-07-13. ^ "Tahiti 1834-1984 - Chap. XII. DEUXIÈME PARTIE L'APPEL DES ÎLES LOINTAINES". Paroisse de la Cathédrale de Papeete. Retrieved 27 July 2015. ^ Maurer, Naomi E. (1998). The Pursuit of Spiritual Wisdom: The Thought and Art of Vincent van Gogh and Paul Gauguin. p. 147. ISBN 9780838637494.